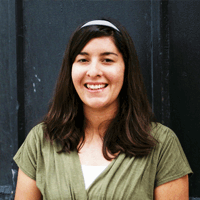 Kira Luna graduated from UNM in 2011, having completed a Master of Arts in Latin American Studies with concentrations in Southwest Studies and Sociology. In part, she chose to study at UNM because of its enriching environment. Not only was she able to choose from classes that focused on issues and topics important to her, such as immigration, but she was afforded the opportunity to live in a community that is profoundly impacted by the immigrant experience as well. Also, Kira notes the staff at the Latin American and Iberian Institute provided an excellent support system. According to Kira, "The multidisciplinary structure of the Latin American Studies program enhanced my analytical skills and allowed me to learn about a variety of issues on both a domestic and global level. This has helped me to be successful within the nonprofit sector, having worked for international and local organizations." Currently, she works as the Education Manager at the Center for Nonprofit Excellence. In this position, she oversees the wide variety of nonprofit management trainings offered throughout the year, and connects the nonprofit community to information and resources.